Even though I'm a big fan of Lancome products, I have never tried any of Lancome brushes. So, few weeks ago, I was about to buy a foundation brush from Lancome when I saw this limited edition brush set and of course, I would not loose a chance to get 4 brushes for half price of what I would need to pay if I bought them each separately. 1. Foundation Brush #2. This is a synthetic bristled brush that's perfect for any liquid foundation and its tapered edge blends makeup for a natural, even look. I absolutely love this brush, it's so easy to make a flawless finish using this brush. 2. Powder brush #1. This is a velvety brush that's incredibly smooth and gives amazing experience while trying to build powder coverage. 3. Dual-End Liner & Shadow Brush #18. This one is so useful__ It has a flat, angled end that precisely lines the lid and, a tapered, rounded end __ that perfectly blends. 4. Angle Shadow Brush #13. This brush with its gently rounded edges is for applying eyeshadow to the crease and corner of the eye. This is the only brush that I'm not crazy about. It's kinda too fluffy for me. Overall, I'm happy with this purchase, these are well made brushes with high quality bristles. I use them on a daily basis and so far they are great. Have you used any of Lancome brushes. Let me know in the comments below and have an amazing day. Those brushes are super gorgeous and look great quality! I need to check these brushes out pronto! They look such good quality. Love the look of that powder brush, so fluffy! Great review! I've never used Lancome brushes but these look great. Thanks for sharing this fabulous set with us. Must say I never tried any brushes from Lancome, I've always seen them as a makeup only brand and to buy brushes from them makes me feel a little weird. LOL! Good to know the brushes are great. Oo this is helpful because I always need some new makeup brush and there are times when I've purchases bad ones! I really need a decent set of brushes! These sound Great! Great set, has all the essential brushes! I had no idea Lancome had makeup brushes. They look great, the packaging is really classy and they seem very soft and fluffy. This is so perfect! I've been looking for some new, good brushes. I always buy mine from Target and they need replaced so frequently! I will definitely have to check out these Lancome brushes! They look so beautiful and soft! I never used any of their brushes, but these looks amazing. I will have to check them out. Those look like great brushes! I need this dual ended brush in my life! It looks os silky soft. I love the brushes, they look elegant! So pretty! I love a good brush set! These brushes look so classy! I haven't tried these before, but sure sounds great. Thanks for sharing. Thanks for the review! My brushes are getting old and I need to get new ones. You just reminded me that I need to buy new brushes! Thanks for sharing these! I've never used Lancome before but I've heard wonderful things about it. Oh, I need this set brush!!!! I'm not too big on makeup so I don't own any brushes. I'm glad you're happy with your purchase though. Great review!! Love these brushes!! I dislike dual ended brushes as if you stand them upright one of them always gets dirty! Loved this brush set. Will give it a try. Lancome brushes are very good certainly! The brushes look awesome! I haven't tried their brushes yet. Love the look of that double-ended brush! I need to try these brushes! They look awesome. These brushes look really nice , and great review on them , will check it out. I think such brushes in good quality are a must for each woman! Thanks for sharing, Nina! I haven't tried any of the Lancome brushes before, so this post was very helpful and insightful on what to expect. They do look like they'd be great quality and an important thing for me is to not have stray brushes stick to my face while applying makeup, that's so annoying! I'm glad you mentioned that these don't :) I'll have to keep this in mind the next time I'm browsing the makeup counters, thanks so much for sharing! Have a great day, beauty! Such a cool set. Love the bag. Interesting review, Nina! I'm using MAC brushes and always willing to try new stuff. 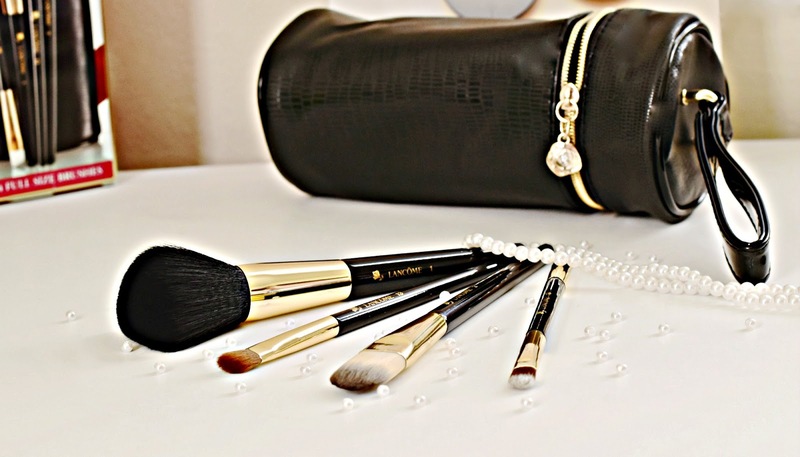 I haven't used Lancome brushes but I love their products in general! Don't we just hate those stray bristles. Cute bag. Great brushes. Oohh this looks so lovely! I purchased a set of Lancome brushes almost 10 years ago and I am still using some of them!! They make high quality brushes! I haven't used any Lancome products before but the brushes look great. I may take a look at them when my current brushes get too old to use. The brushes look really good, love the travel case it comes in. nice review dear. Hi Nina and thank you for your visit. So beautiful review...Lancome is a very guarantee of quality!!! ooooh I like the look of the dual ended brush. They all look so luxe and soft. Oh I have been thinking of getting new brushes I will check this out, I got a gift box of Lancome perfume samplers and I love every scent which is unusual for me. They do make some great beiaty products.